The interesting NatWest t20 Blast 2014, will come to an end on August 23, 2014, at Edgbaston, Birmingham, where two semi-finals and the Final will be played on the same day. Lancashire proved to be a most successful side of the tournament by accumulating 22 points from 14 games they played in the North Division pool. Hampshire managed 18 points from 14 matches in South Division and they beat Nottinghamshire by a hefty margin of five wickets in the 4th quarter-final. 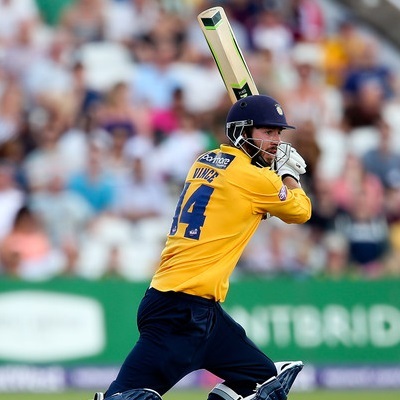 The skipper of Hampshire, James Vince, demonstrated a match winning unbeaten knock of 93 in the previous game whereas Michael Carberry, Jimmy Adams and Sean Ervine are their prime batsmen. Danny Briggs is the highest wicket taker for his team with 21 scalps and he is being well assisted by Matt Coles and Will Smith. Usman Khawaja played a positive innings of 67 in the 1st quarter-final whereas Karl Brown, Tom Smith and Ashwell Prince have contributed valuable runs throughout the event. Jordan Clarke grabbed four wickets in the last match and was declared ‘Player of the match’ whereas Kabir Ali and Steven Croft have the ability to defend their total. Saturday August 23, 2014 @ 13.30 GMT, 14.30 local at Edgbaston, Birmingham. Mostly cloudy with the temperatures around 13-19ᵒC. Hampshire – James Vince (C), Michael Carberry, Glenn Maxwell, Jimmy Adams, Matt Coles, Will Smith, Sean Ervine, Adam Wheater, Liam Dawson, Chris Wood, Danny Briggs, Kyle Abbott.